A new service formally launches today that provides fixed-fee legal help to businesses for common matters such as business formations, employment agreements, confidentiality agreements and trademark registrations. The service, Legal Hero, promises to provide businesses with clearly priced legal help from lawyers who have been carefully vetted for quality and experience. The service has been operating in beta since last spring and officially begins offering its services today. Its services are available nationwide for intellectual property and immigration projects. They are available in New York and Massachusetts for all projects, with new states slated to be added soon. Legal Hero was founded by Annie Fernandez Webber, a graduate of both Harvard Law School and Harvard Business School and a former corporate lawyer at Ropes & Gray in Boston. In September, it closed a seed round of $715,000 from a consortium of angel investors. Businesses that use the site are presented with a menu of services to choose from. Services cover common business legal needs related to starting a business, hiring and managing employees, operating the business and protecting IP. Each item on the menu specifies the fixed cost of the service. For example, to prepare an employment agreement, the cost is $600. To review an employment agreement, the cost is $300. Once a business selects a service, it is asked to select a lawyer. It is presented with a list of lawyers licensed in the business’s jurisdiction who provide that service. The list provides biographical information about each lawyer as well as a link to the lawyer’s LinkedIn profile. After selecting a lawyer, the business is asked to provide brief details about the project. After the business submits the details and makes the payment, and after the lawyer performs a conflict check, the business and the lawyer enter into a limited-scope engagement letter. From there, the lawyer works directly with the business. If the business needs help with an item that is not listed, it can fill out a form describing the project. Legal Hero will then have matching attorneys from its network submit bids for the business to review. Legal Hero’s revenue will come from a “transaction and technology fee” that the business is charged for each matter. This fee is included in the total fee for the project. The payment page details this breakdown, showing the total fee, the amount of the total fee that is paid as a legal fee to the lawyer, and the amount that is paid to Legal Hero. For example, of the $900 charged for a single-founder business formation, the site explains that the attorney fee is $750 and the transaction and technology fee is $150. Lawyers pay nothing to participate in the network. The pricing above is based on typical fact patterns associated with this type of legal project. Lawyers on the network have agreed to a fixed fee for projects with these typical fact patterns, but pricing is not fixed until you sign an engagement letter with your chosen lawyer. If your project has an unusual fact pattern and the lawyers are therefore unable to complete the project at the fixed price, we will let you know right away. We’ll then give the lawyers on our network the opportunity to bid on your project. Webber said that Legal Hero attempts to screen submissions for any that may not fit that “typical fact pattern.” I asked whether she was concerned that the screening could breach the attorney-client privilege. She was not, she said, because they screen only for discrepancies that stand out in the initial submission, such as purchasing a single-founder business formation and then listing two founders. Webber told me that she and her staff carefully vet the lawyers who are accepted to participate in the Legal Hero network. They directly interview every applicant and look at their years of experience, employment history and law school. As of yesterday, the lawyers in the network averaged 15 years of experience and include several who worked at prominent firms such as Skadden Arps and Davis Polk, Webber said. 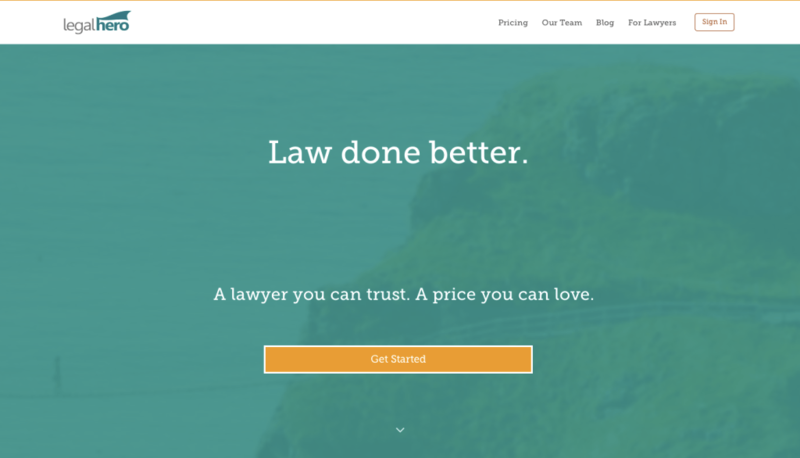 Legal Hero handles the billing for the lawyers in its network. It also provides the lawyers with a dashboard where they can monitor the status of their cases and exchange messages with clients. The company plans eventually to build this out to include a suite of case management and document management tools. In speaking with Webber, she emphasizes that she grew up in a family that started a small business in Miami in the 1970s and built it into a successful operation that remains in business today. Through her family and through other small business owners and entrepreneurs she has met, she has seen that one constant among them is difficulty finding good legal advice at a fair price. With Legal Hero, she hopes to change that.